While Dave Bautista started his career in wrestling and the MMA, he has become a bigger and bigger star in Hollywood. He had an early role with Groot voice actor Vin Diesel in Riddick and also appeared in RZA’s The Man with the Iron Fists. But his role as Drax in Marvel‘s Guardians of the Galaxy put him on the map with general audiences. Bautista has continued to grow as an actor and audiences will see more of him in Guardians of the Galaxy Vol. 2 and the upcoming Blade Runner 2049. And if that wasn’t enough, he’ll be back in Avengers: Infinity War, which is filming now. We met Bautista, in full Drax makeup, on the Guardians of the Galaxy Vol. 2 set in Atlanta back in April 2016. I found him to be funny, friendly, and very approachable despite his intimidating size and gray/green makeup. Q: Have they made it any easier on you with the makeup for the sequel? Dave Bautista: It’s so easy, you wouldn’t believe it. I’m not kidding. It takes like an hour and a half now. The last one, they got it down to four hours and everyone was celebrating. This, literally they attack me with paint rollers all over. And it looks better too. It looks way better. Q: Is it just more people? Q: How many people does it take to put everything on you? Bautista: I have a team of five guys. Q: After the original film, there was a thing that popped up on the Internet about Drax, which is it turned out people with autism found Drax to be a character they could really deeply relate to? Is that impacting you moving forward with the character? Bautista: That would be a question more I think for James [Gunn]. He writes for Drax and he has a great time doing it. [laughs] I thought about it a lot. It’s really a cool thing. It’s really kind of hard to describe. But it kind of just feels good when you can influence anybody in a positive way, that you’re being a positive role model for somebody. It’s a good feeling, it’s a really good feeling, but I try not to read into it too much, because I just don’t want to put that pressure on myself. But I do my thing and hopefully people are entertained by it and some positive things will spread from it. I try not to read into that stuff too much, because then I’d have to be really worried about any role that I ever played. I’d have to be worried about when I play a bad guy or I play a scumbag. I try to go from role to role and I want to do these different characters, so I just try not to read into it too much. Q: It seems like Drax finds a kindred spirit in Mantis. Can you talk about their relationship? Bautista: No. I don’t know how much has been disclosed. Obviously Mantis is in this film. For the sake of my job, we should kind of leave it at that right now. Q: Kevin told us that Drax and Mantis have a connection because they’re both awkward. Bautista: I think they’re both very awkward, but I think they’re both – I always said this: at the very core of Drax, he’s really just heartbroken. There’s a real innocence about Drax, and I think Mantis has that as well, and I think that’s probably where the connection would be the most. There’s just a very child-like innocence with both characters. Q: We heard at the beginning, the Guardians are very full of themselves and very cocky. Does Drax buy into that? What are his feelings about it? 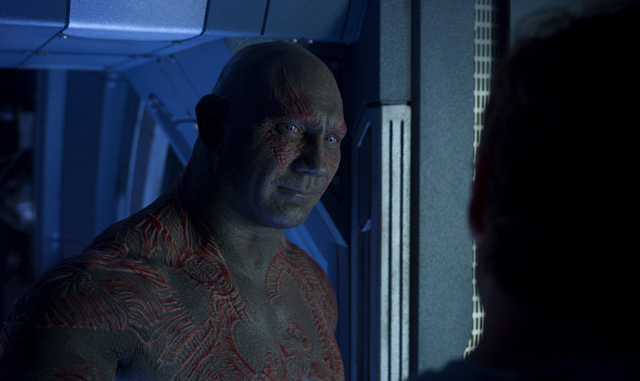 Bautista: [laughs] There maybe somewhat of a sense of self-righteousness to Drax, but no. I’ve always described Drax as at the heart of Drax there’s really just a heartbroken guy. He’s really heartbroken over the loss of his family. I think he has one mission, and that is revenge. Q: To that end, does he still talk about going after Thanos? Does he want the team to focus on that at all? Bautista: Mmm. Hmm. Yeah. You know… [hedges] That’s a real touchy subject. I think everybody knows from the first film that’s always going to be his mission. That is the reason he is living right now. But yeah, we’ll kind of just leave it at that for now. 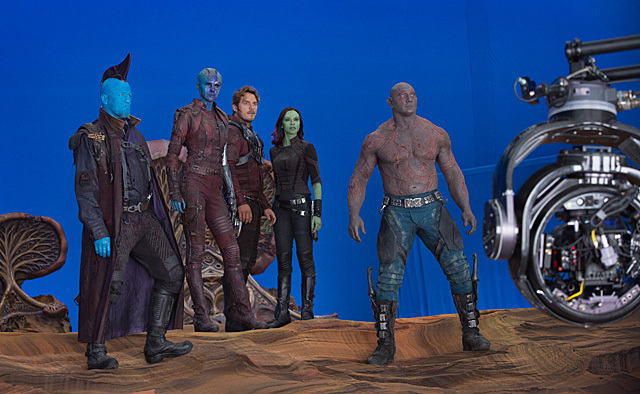 Q: We know towards the beginning of the movie the Guardians split up. Where does Drax fall into that? Bautista: We’re family at this point. I’d have to disagree with that point. We don’t really go our separate ways at all. We’re very much, I think, a family at this point, as we left off in the last film. I think we pick up right where we started. I think that will be fair to say. There’s not really division amongst us. I think we all have the same mission. Q: Has your character evolved in terms of the fighting styles? Any weapons? Bautista: No, I think if I can say that he has evolved at all, I think that he’s just more prominent in this film. I think James really just found such an amusement to Drax. An amusement for writing for Drax. He’s just more prominent in this film, which is great for me, and he may have developed a bit more faith in me as well. I was still kind of the new guy on set with the last film. I kind of pulled my weight, and he’s developed even more faith in me, so he’s written for me more. That’s just my take on it. Q: What’s it like working with Kurt Russell? Bautista: It’s pretty great, man. [laughs] It’s pretty great. It was weird. I felt like such a fanboy. The first day, I was like, “I’ve got to ask you about this, man: How do you feel about the Rock being cast as Jack Burton?” And he was like, “Yeah, great.” I wanted to hear the opposite: “I think it’s s**t. I think it’s s**t casting, man. They cast the Rock as Jack Burton, I just don’t agree. Like, Chris Pratt to me is Jack Burton,” but that’s the fanboy in me, man. I take things like that personally. [laughs] But he doesn’t take that personally at all. He’s like, it’s the character you’re portraying, now it’s time to move on. Next character. But yeah, a lot of Snake Plissken stories going around, stuff like that. Constantly bugging him about what we want to know. What’s really weird, especially for someone — because he grew up in Hollywood, grew up in film, so it’s kind of weird to meet people that grew up in films who are still in touch with reality. I’ve met a few people and they’ve been sheltered their whole life and just totally out of touch, and Kurt is not like that at all. He’s like super down to Earth and just a real dude and real friendly to everybody, and that’s kind of cool to see, because I’ve seen the opposite, so it’s really cool to see someone who comes on and just is real down to Earth. There’s nothing superficial or pretentious about him. He’s been just very patient with everything. He’s never in a rush, he doesn’t keep to himself, he doesn’t separate himself from the cast, so it’s kind of cool. Q: What does Drax think about Baby Groot? Bautista: [laughs] I don’t think Drax and The Tree are ever going to get along. Just always going to be at odds with each other. It’s like that sibling rivalry, it’s what it feels like to me.